Like other Hanging Parrots, this species roosts upside down and may also take a bath in the rain in the same position. 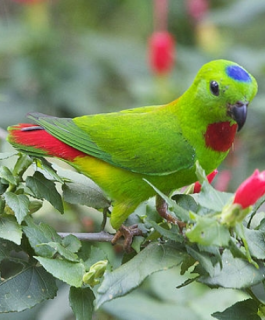 Male-in general green plumage; dark blue patch on crown; orange/yellow wash on mantle; red rump and upper tail coverts; band across lower back yellow; red throat patch. Bill black. Eye dark brown. Female-minimal blue on crown and orange/yellow on mantle; red throat patch absent; yellow band on lower back absent. As in adult female but with grey forehead washed with blue; blue on crown and orange/yellow on mantle absent; green rump with feathers margined red. Bill yellow/brown. Calls made in flight shrill and squeaky. Group calls rapidly repeated or ringing. While feeding notes are occasionally shrill and with two syllables. Planted walk-in aviary, minimum length 1.5m (5 ft); outdoors if in warm climate, with small attached shelter. Fruits such as: apple, pear, pomegranate, guavas where available, the large fruits halved and not chopped; berries such as: blackberries, redcurrants; small seeds such as: canary, millet; soaked oats; spray millet; sponge cake and nectar; insectivorous food; clean mealworms, maggots and ant pupae; complete pellet if taken. House with other individuals, provide daily bathing bowls. Provide unsprayed flowering branches, and willow and elder branches to strip. Nest log 15cm x 40cm (6 x 15.6 in). Heavily traded in international wild bird market: since 1981, 75,239 individuals have been recorded. Found on the Malay Peninsula and Singapore, to Sumatra and surrounding islands; also on Borneo and surrounding islands. Introduced near Jakarta. Found up to 1300m (4264 ft). Occurs around forest edge, forest, riverine growth areas, mangrove, secondary growth, lightly wooded areas, bamboo clumps, orchards, rural areas and coconut groves. Eats flowers, buds, fruits, nuts and seeds. Birds travel the canopy and middle storey. They are seen singly, in pairs or, outside the breeding season, in parties of 150 or more individuals. Roosting is done upside down, hence the name "hanging parrot".